Remember that 1950s Greyhound Bus Lines jingle “It’s such a comfort to travel by bus – and leave the driving to us?” That slogan also applies to Estes Park’s expanded bus shuttle system. Park your car for the day in a spacious parking lot, hop a shuttle and leave the driving to our friendly, courteous shuttle drivers.It’s a great way to see the Estes Valley. Visit the downtown business district, local amusement destinations, the outlying lodging areas and even Rocky Mountain National Park in the comfort of a roomy shuttle bus with tinted, out-sized windows. Instead of watching the road, gaze out the window at the beautiful Rocky Mountains.Estes Park’s free shuttles are easy to find.Silver Shuttle at Fairgrounds Park-n-RideIf you’re arriving in Estes Park on Highway 36, turn left on 4th Street and follow the signs to the new Park-n-Ride next to the Fairgrounds at Stanley Park where nearly 400 parking spaces await. Step aboard a silver shuttle, which leaves the shelter every 15 minutes, for a loop to the Estes Park Visitor Center and back.Shuttles at Estes Park Visitor CenterAt the Visitor Center at the intersection of Highways 34 and 36, you can catch shuttle to nearly 40 destinations, from your cabin to the shops downtown. The shuttles are divided into Red, Blue and Brown routes and will take you to the central business district and outlying lodging and amusement areas. 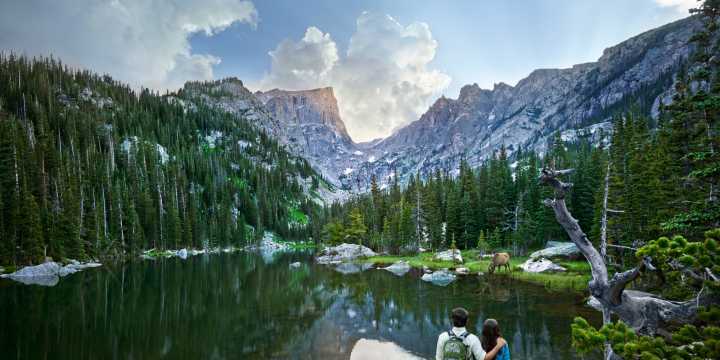 At each stop riders will find a map and a schedule for each route.Hiker Shuttle to Rocky Mountain National ParkParking spots are at a premium in Rocky Mountain National Park during the busy summer months. So it’s a smart idea to take the express “Hiker Shuttle” from the Visitor Center to Rocky Mountain National Park’s Beaver Meadows Visitor Center, which then proceeds to the Park & Ride on Bear Lake where it connects to many of the campgrounds and trailheads in the Park.For detailed routes and times for all the free shuttles, pick up a free map at the Visitor Center or print a copy from the Estes Park Convention and Visitor Bureau website at www.visitestespark.com.